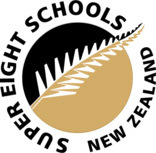 Super 8 is an association made up of boys schools in the central North Island of New Zealand. The association was established in 1997 in response to a lack of competition the schools faced in their home regions. This concept has now expanded to include cultural activities and academic awards. The Super 8 competition includes some of the top schools in New Zealand who have a very proud sporting, cultural and academic history. Schools included, in the association with New Plymouth Boys’ High School, are: Hamilton Boys’ High School, Rotorua Boys’ High School, Tauranga Boys’ College, Gisborne Boys’ High School, Napier Boy’s High School, Hastings Boys’ High School, and Palmerston North Boys’ High School. The association brings the schools together in some of the toughest sporting competitions in New Zealand. Cricket teams play an annual one-day tournament in late January. Volleyball, golf and tennis meet for a summer tournament in March. The 1st and 2nd XV rugby teams play in a Saturday competition from June to August which culminates in a final between the top two sides from the round. Basketball, football and hockey all compete in a three-day tournament in July as a build-up to nationals. Other Super 8 sports include: badminton, chess, and cross-country as well as a cultural festival.